Not just a slogan: always pastured, always organic. we won’t use Pyganic to control insects because it also kills our bees; instead we plant trap crops to host the unwanted insects. we won’t use manure as a fertilizer from any non-organic farm because that mostly likely will contain traces of antibiotics, GMOs, chemicals. Fortunately, our organic livestock produce enough manure for our farm! And we only buy organic food, cleaning supplies, clothing, etc., when we can find those options. This also means we eat out rarely…but then, when we grow our own organic meats, eggs, milk, produce…why would we? 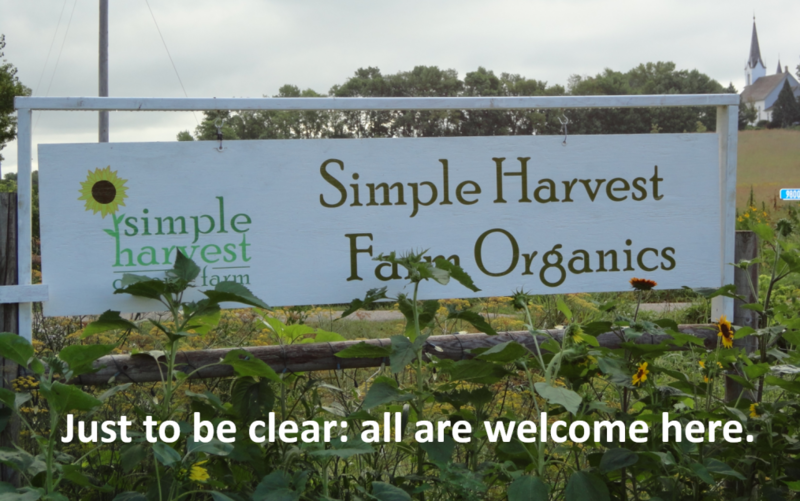 Simple Harvest Farm Organics is a 20-acre organic farm, where the land, crops, produce, and livestock are all organic. We keep the livestock on pasture and feed a vegetarian diet; so we feed no antibiotics, no hormones, and no additives. Just corn, oats, wheat, barley, soybeans, vitamins, minerals, and apple cider vinegar. And all the livestock get hay – ruminants and monogastrics! Since we like to raise our livestock on pasture, we raise our outdoor poultry and pigs only during the warmer months. Even in the winter our animals are not raised in confinement; although the hens do not like to venture out of their coop when there is too much snow on the ground! We like how the animals and plants on our farm complement each other – and how together they are building a stronger and healthier environment. Our animals produce manure that fertilizes the plants and builds the soil; the plants provide food for the animals and help hold soil and water in place. We feel fortunate to work beside them. We realize we can’t produce healthy food the way we do without having many, many supportive customers who value our food and our work as much as we do. We thank you for your support – and want you to know that we in turn donate food to people in the area who need it. Sometimes our donations go through the Food Shelves; sometimes it’s directly to families…wherever our food goes, it’s always enjoyed!